Background: Hepatocellular carcinoma (HCC) with tumor thrombus extending to the inferior vena cava (IVC) and right atrium (RA) is rare, which is generally associated with serial syndromes and poor prognosis. The results of earlier observations revealed that the median survival was 1–5 months after diagnosis for untreated patients. The prognosis was poor with surgery, radiotherapy, transarterial chemoembolization (TACE), and chemotherapy. Methods: A total of 1850 patients received TACE for advanced HCC at our institution from October 2011 to September 2016. Among them, 18 cases presented tumor thrombus extended from hepatic vein to IVC and RA. TACE was performed to deal with the tumor thrombus inside the RA, and angiography was performed for characterizing. The successful rate, survival, safety, and clinical adverse events were retrospectively studied. Results: A total of 56 interventional procedures were conducted for the 18 cases of tumor thrombus extending to IVC and RA. TACE were successfully performed in all patients without significant complications. One case died of pneumonia, and no severe adverse effect was observed in the other 17 cases. The 1- and 3-year overall survival rates were 50% and 16.7%, respectively. The average survival from diagnosis of right atrial tumor thrombus (RATT) was 15.2 months. The blood supply was rich for all RATT. There were seven cases with single-feeding artery and 11 cases with two or three feeding arteries that originated from intra- or extra-hepatic arteries. The extrahepatic artery played a critical role in the blood supply of RATT, including right inferior phrenic artery (8/18), left inferior phrenic artery (1/18), and the left gastric artery (2/18). Conclusion: For HCC with tumor thrombus in the IVC and RA, TACE could safely improve the prognosis of these patients. Searching for multiple feeding arteries are essential for ensuring efficacy. In addition, careful examination and appropriate embolization technique are essential for safety and efficacy. Lipiodol was a safe and ideal agent for the embolization in RATT. Surgery,, radiotherapy, transarterial chemoembolization (TACE), chemotherapy, and ablation have been applied for treating RATT. However, the standard treatment modality has not been established. Surgical removal of IVC and RATT combined with hepatectomy has been the only radical treatment for improving the prognosis, such as reducing the risk of systemic metastasis, incidence of deadly pulmonary embolism, and occlusion of tricuspid valve. However, aggressive surgical resection was not common because the surgical approach for treating IVC and RATT was considered complicated and hazardous, which was only applicable in limited cases. Although TACE was a relatively safe treatment procedure, its therapeutic effects on tumor thrombus in IVC and RA remained unsatisfactory. Some authors even considered these as contraindications for TACE and suggested radiotherapy for extrahepatic lesions. In this study, we retrospectively investigated 18 HCC patients with IVC and RATT who successfully received TACE. This study was aimed to review the TACE-based treatment of such patients, including the technique, anatomy findings, safety, and efficacy. A total of 1850 patients received TACE for advanced HCC at our institution from October 2011 to September 2016. Among them, 18 cases presented tumor thrombus extended from hepatic vein to IVC and RA. TACE was performed to deal with the tumor thrombus inside the RA, and angiography was performed for find the feeding artery. The successful rate, survival, safety, and clinical adverse events were retrospectively studied. All patient have given their consent for their images and other clinical information to be reported in the journal. Pretreatment evaluation consisted of a complete history and physical examination, blood cell count, coagulation test, liver and renal panels, AFP/CEA/CA199 levels, computed tomography (CT) scan of the chest, tri-phase CT scan, or dynamic magnetic resonance imaging (MRI) of the upper abdomen. Pre-TACE CT or MRI showed lesions inside the liver and filling defects in hepatic vein, IVC, and RA. The treatment protocol included 1–7 sessions of TACE (average of four times), depending on the intrahepatic tumor burden and whether there was enhancement on abdominal CT scan. Chest CT scan was performed 1–3 days after TACE for evaluating potential lung injury and lipiodol deposition in both intrahepatic lesion and the tumor thrombus. All the patients were followed up every 2 months for further evaluation. Moreover, when new lesions or recurrence was detected, further TACE would be performed. The characteristics of the patients are presented in [Table 1]. All digital subtraction angiography (DSA) procedures were performed under the guidance of GE Innova 4100IQ 4100IQ(General Electric Company). The right femoral artery was cannulated with a 5F vascular sheath (Radifocus Introducer II; Terumo Corp., Japan) by Seldinger's technique. Selective angiography was performed on the celiac artery, superior mesenteric artery, inferior phrenic artery, renal artery, internal mammary artery, and intercoastal artery, using a 5F RH catheter or headhunter catheter, Cobra catheter, or Yashiro catheter. Superselective angiography was conducted using a 2.6 or 2.8 Fr microcatheter, with administration from the supplying branch of tumor. Lipiodol was injected until it stopped flowing in the artery, directly feeding the tumor. 100–300 um Biosphere (COOK Corp., USA) was injected as supplement if necessary. Dosage of lipiodol per procedure ranged from 3 to 22 ml (Guerbet Corp., France), mixed with 20 mg of doxorubicin (Pfizer Pharmaceuticals Limited, USA). After the TACE, patients were administered with glutathione (1, 2g, i.v., qd, Shandong Luye Pharma Group Ltd., China) to recover liver functions, as well as analgesic and an anti-emetic agent. On the 3rd day after the completion of TACE, the patients were assessed for adverse effects by a physical examination and laboratory testing, including blood cell count and liver and renal panels. Besides, chest CT scan was ordered 1–3 days after TACE to evaluate potential lung injury and lipiodol deposition in the tumor intrahepatic and extrahepatic lesions. For all the cases, hepatic artery was involved in the blood supply of RATT. The hepatic artery was the only feeding artery in seven cases. 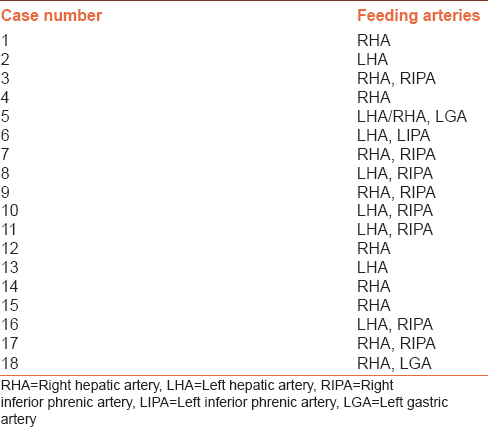 For the rest 11 cases, there were extrahepatic feeding arteries, including right inferior phrenic artery (RIPA), left inferior phrenic artery (LIPA), and the left gastric artery (LGA) [Table 2]. IVC angiography of a 38-year-old male patient showed filling defect in the IVC/RA [Figure 1]a, and celiac artery angiography showed RATT was fed by the left gastric artery [Figure 1]b and [Figure 1]c.
IVC angiography of a 61-year-old male patient showed filling defect in the IVC/RA and collateral circulation of IVC system [Figure 2]a; RATT was fed by the RIPA [Figure 2]b.
Post-TACE CT showed deposition of lipiodol in liver lesions and RATT [Figure 2]c and [Figure 2]d.
Three-dimensional (3D) scan of DSA of a 61-year-old female patient showed huge filling defect in the IVC/RA [Figure 3]a and [Figure 3]b.
Post-TACE CT showed deposition of lipiodol in liver and IVC/RATT [Figure 3]c and [Figure 3]d.
RIPA angiography of a 67-year-old male patient showed an IPA-fed RATT [Figure 4]a and [Figure 4]b.
Hepatic artery angiography of a 58-year-old male patient showed a branch of the hepatic artery feeding the right hepatic vein, IVC/RA tumor thrombus, stride sign revealed the existence of arterioventricular (A-V) shunt in the hepatic artery and vein, lipiodol was given, and no pulmonary embolization (PE) was found; lipiodol was deposited well in the tumor thrombus [Figure 5]a,[Figure 5]b,[Figure 5]c.
All the cases were examined with postoperative CT. The results showed deposition of lipiodol in both intrahepatic lesions and RATT. The RATT was confirmed to be shrinked with radiological examination in ten cases, maintaining stable condition in eight cases. No sign of broken off of RATT and pulmonary embolism was observed. The follow up lasted for 50 months. The 1- and 3-year survival rates were 50.0% and 16.7%, respectively, and the average overall survival was 15.2 months since the diagnosis of RATT. One case died of lung infection 2 weeks after TACE, and three cases died of gastrointestinal bleeding within 3 months. Complete response, partial response, stable disease, and progression disease for intrahepatic disease were observed in 0, 10, 5, and 3 patients, respectively. The survival time is listed in [Figure 6]. RATT in all cases was stable after the TACE, without evidence of dislodging after TACE. Postoperative CT scan showed that no pulmonary embolism was associated with dislodging of RATT. In addition, there was no case of heart failure or dyspnea, and lipiodol deposition was not observed in the lung parenchyma. The main discomfort of patients was abdominal pain and fever. Medium level of liver injury was observed in four cases, which lasted for 1–2 weeks. One case died of pneumonia after 2 weeks. Before TACE, patients presented systemic symptoms such as ascites, lower-limb edema, and scrotal edema. After TACE, nine cases of ascites disappeared or decreased and five cases of lower-limb edema and three cases of scrotal edema disappeared or relieved. Liver function improved in five cases (before TACE, the levels of alanine aminotransferase, aspartate aminotransferase, albumin, and total bilirubin were 92.3 ± 26 IU/L, 87.5 ± 23.5 IU/L, 32.1 ± 4.2 g/L, and 53.4 ± 11.2 μmol/L, respectively; after TACE, they were 47.6 ± 13.2 IU/L, 57.6 ± 12.7 IU/L, 37.3 ± 5.2 g/L, and 33.6 ± 8.5 μmol/L, respectively). With the development of treatment technology, survival rate of HCC has been significantly improved. However, HCC with metastatic IVC and RATT still leads to an extremely poor prognosis. For the patients in this group, the average survival time prolongs to 15.2 months. Complete searching and embolization of all feeding arteries for RATT may contribute to this improvement. IVC/RA metastases are generally considered to be the extension of the intrahepatic HCC, with blood supply from hepatic artery. Since the tumor thrombus is connected to the main body of the intrahepatic lesion, it is usually supplied by hepatic artery. However, the blood supply may be also from the adjacent arteries. Therefore, it is very important to perform the systematic and comprehensive angiography. Although RATT is relatively small compared to intrahepatic lesions (2.1–7.3 cm in this group), the ratio of collateral branches is beyond our anticipation. Of all the 18 cases, single-feeding artery was only observed in seven cases and 2–3 feeding arteries were observed in the rest of the 11 cases. Except for hepatic artery, extrahepatic feeding arteries were involved in RATT blood supply in 11 cases, including eight cases of RIPA (8/18), one case of LIPA (1/18), and two cases of LGA (2/18). In short, all the potential feeding arteries should be carefully searched for performing TACE for IVC and RATT. After screening the feeding artery, chemotherapeutic agents (lipiodol) were delivered to the tumor thrombus via a microcatheter. During delivering lipiodol, X-ray fluoroscopy should be continued. It aims to carefully observe if there is A-V shunt (including hepatic artery–hepatic vein or tumor feeding artery–hepatic vein) and judge whether the lipiodol would flow crossing the potential shunt. We could use 1 mL of lipiodol experientially as tentative embolization. In general, lipiodol would be deposited in the tumor and can be observed under fluoroscopy. If the sign of deposition could not be observed, we should stop delivering more lipiodol; otherwise, more lipiodol could be injected. Since the collateral artery always feed vital organ such as lung/heart and gastric, superselectivity catheter must be achieved to protect these organs, and the injection speed must be carefully controlled to avoid reflux into nontarget artery. For intrahepatic lesions, lipiodol could be given with usual speed. For RATT, the speed of lipiodol injection should be as slow as possible, because the collateral feeding artery was usually slim and winding for a long distance. Even with the 2.6Fr microcatheter, the blood flow would be slow due to the blocking effects. Therefore, the lipiodol must be delivered slowly and intermittently, and then more lipiodol could be absorbed by the RATT, decreasing the incidence of vascular recanalization. During embolizing, the deposition of lipiodol in RATT could be gradually displayed. With the injection of more lipiodol, scattered high-density shadow could be observed in the RA area, and then the high-density area would be gradually expanded. One of its most prominent features was lipiodol inside RATT beating with same rate of heartbeat. A-V shunt on hepatic artery angiography was observed in eight patients. In four cases, we avoided the involved branch and lipiodol was delivered from other branch; in two cases, there was small amount of lipiodol flow across the shunt, but more lipiodol was absortbed by the tumor without accumulating in the lung during follow-up; in two cases, no lipiodol was found to flow across the shunt, and the lipiodol was quickly deposited into the tumor thrombus, and then lipiodol was further given until stasis appeared. No thrombus dislodgment was noted in our study. However, there was still a risk for tumor thrombus dislodgment. Therefore, CT scan should be performed every 1–2 months to evaluate the stability of tumor thrombus. Another issue accompanied with RATT was hemodynamics change, including IVC syndrome and Budd–Chiari syndrome. Intracardiac tumors have been reported as the cause of such syndromes.,, Different from single myxoma, sarcoma,, thrombus, or primary malignant cardiac tumor,, all our cases presented IVC tumor thrombus. IVC and RATT may lead to obstruction of the IVC and the hepatic veins at the suprahepatic level. It would also contribute to centrilobular hepatic congestion, which would be subsequently developed into fibrosis and cirrhosis. After TACE, lipiodol would not only be deposited in RATT, but also in IVC and hepatic vein tumor thrombus. Then, the intrahepatic and extrahepatic tumor thrombus atrophy, ascites, and edema of lower limb and scrotum could be disappeared or relieved, indicating the relief of hepatic vein obstruction. Liver function would also be improved. However, due to the retrospective design and small sample size of this study, there were some limitations. A multicenter prospective study with a large sample size would be necessary to definitively establish the benefits of TACE management. This retrospective study demonstrated that TACE for HCC with tumor thrombus in the IVC or RA could safely improve the prognoses of these patients. It could not only prolong the survival time, but also improve the life quality of the patients. To ensure the effects, searching for intra- and extra-hepatic feeding arteries is very important. Lipiodol is a safe and ideal agent for embolization in RATT. The effects of embolization could be ensured with good operation and procedure. Thomas MB, Jaffe D, Choti MM, Belghiti J, Curley S, Fong Y, et al. Hepatocellular carcinoma: Consensus recommendations of the national cancer institute clinical trials planning meeting. J Clin Oncol 2010;28:3994-4005. Alves RC, Alves D, Guz B, Matos C, Viana M, Harriz M, et al. Advanced hepatocellular carcinoma. Review of targeted molecular drugs. Ann Hepatol 2011;10:21-7. Xue TC, Xie XY, Zhang L, Yin X, Zhang BH, Ren ZG, et al. Transarterial chemoembolization for hepatocellular carcinoma with portal vein tumor thrombus: A meta-analysis. BMC Gastroenterol 2013;13:60. Saito M, Seo Y, Yano Y, Uehara K, Hara S, Momose K, et al. Portal venous tumor growth-type of hepatocellular carcinoma without liver parenchyma tumor nodules: A case report. Ann Hepatol 2013;12:969-73. 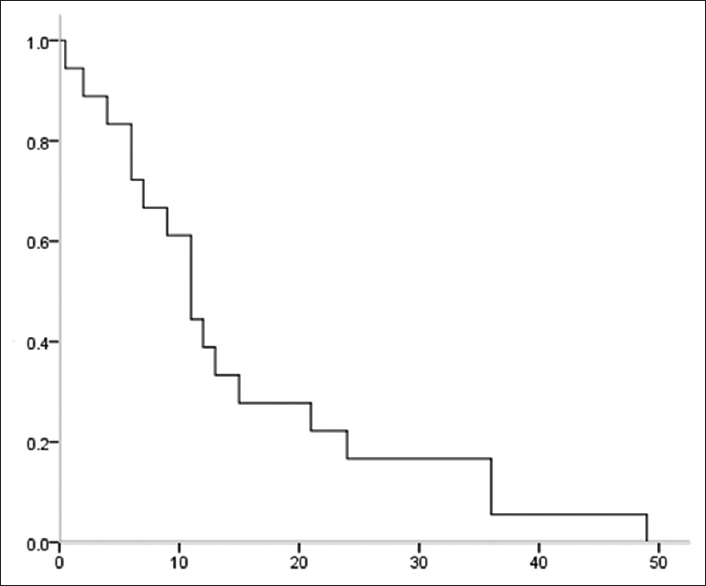 Wang Y, Yuan L, Ge RL, Sun Y, Wei G. Survival benefit of surgical treatment for hepatocellular carcinoma with inferior vena cava/right atrium tumor thrombus: Results of a retrospective cohort study. Ann Surg Oncol 2013;20:914-22. Chang JY, Ka WS, Chao TY, Liu TW, Chuang TR, Chen LT, et al. Hepatocellular carcinoma with intra-atrial tumor thrombi. A report of three cases responsive to thalidomide treatment and literature review. Oncology 2004;67:320-6. Wakayama K, Kamiyama T, Yokoo H, Kakisaka T, Kamachi H, Tsuruga Y, et al. Surgical management of hepatocellular carcinoma with tumor thrombi in the inferior vena cava or right atrium. World J Surg Oncol 2013;11:259. Kawakami M, Koda M, Mandai M, Hosho K, Murawaki Y, Oda W, et al. Isolated metastases of hepatocellular carcinoma in the right atrium: Case report and review of the literature. Oncol Lett 2013;5:1505-8. Chun YH, Ahn SH, Park JY, Kim DY, Han KH, Chon CY, et al. Clinical characteristics and treatment outcomes of hepatocellular carcinoma with inferior vena cava/heart invasion. Anticancer Res 2011;31:4641-6. Le Treut YP, Hardwigsen J, Ananian P, Saïsse J, Grégoire E, Richa H, et al. Resection of hepatocellular carcinoma with tumor thrombus in the major vasculature. A European case-control series. J Gastrointest Surg 2006;10:855-62. Papp E, Keszthelyi Z, Kalmar NK, Papp L, Weninger C, Tornoczky T, et al. Pulmonary embolization as primary manifestation of hepatocellular carcinoma with intracardiac penetration: A case report. World J Gastroenterol 2005;11:2357-9. Pesi B, Giudici F, Moraldi L, Montesi G, Romagnoli S, Pinelli F, et al. Hepatocellular carcinoma on cirrhosis complicated with tumoral thrombi extended to the right atrium: Results in three cases treated with major hepatectomy and thrombectomy under hypothermic cardiocirculatory arrest and literature review. World J Surg Oncol 2016;14:83. Koo JE, Kim JH, Lim YS, Park SJ, Won HJ, Sung KB, et al. Combination of transarterial chemoembolization and three-dimensional conformal radiotherapy for hepatocellular carcinoma with inferior vena cava tumor thrombus. Int J Radiat Oncol Biol Phys 2010;78:180-7. Chung SM, Yoon CJ, Lee SS, Hong S, Chung JW, Yang SW, et al. Treatment outcomes of transcatheter arterial chemoembolization for hepatocellular carcinoma that invades hepatic vein or inferior vena cava. Cardiovasc Intervent Radiol 2014;37:1507-15. Li W, Wang Y, Gao W, Zheng J. HCC with tumor thrombus entering the right atrium and inferior vena cava treated by percutaneous ablation. BMC Surg 2017;17:21. Rajasekharan C, Ganga V. A rare cause for acute cor pulmonale. Case Rep Gastroenterol 2011;5:330-5. Chern MC, Chuang VP, Cheng T, Lin ZH, Lin YM. Transcatheter arterial chemoembolization for advanced hepatocellular carcinoma with inferior vena cava and right atrial tumors. Cardiovasc Intervent Radiol 2008;31:735-44. Liapi E, Geschwind JF. Transcatheter arterial chemoembolization for liver cancer: Is it time to distinguish conventional from drug-eluting chemoembolization? Cardiovasc Intervent Radiol 2011;34:37-49. Igaki H, Nakagawa K, Shiraishi K, Shiina S, Kokudo N, Terahara A, et al. Three-dimensional conformal radiotherapy for hepatocellular carcinoma with inferior vena cava invasion. Jpn J Clin Oncol 2008;38:438-44. Chong VH, Jamaludin AZ, Lim KS, Abdullah HM, Nair RT. Hepatocellular carcinoma with intravascular and right atrial extension. Indian J Gastroenterol 2008;27:255. Imada S, Ishiyama K, Ide K, Kobayashi T, Amano H, Tashiro H, et al. Inferior vena cava tumor thrombus that directly infiltrated from paracaval lymph node metastases in a patient with recurrent hepatocellular carcinoma. World J Surg Oncol 2013;11:177. Anagnostopoulos GK, Margantinis G, Kostopoulos P, Papadopoulou G, Roulias A, Sakorafas G, et al. Budd-Chiari syndrome and portal vein thrombosis due to right atrial myxoma. Ann Thorac Surg 2004;78:333-4. Mete UK, Singh DV, Bhattacharya A, Kakkar N. Fulminant Budd-Chiari syndrome caused by renal primitive neuroectodermal tumor with inferior vena cava thrombus extending to atrium. J Cancer Res Ther 2015;11:1038. Cujec B, Ulmer B, McKaigney JP, Bharadwaj B. Right atrial myxoma presenting as Budd-Chiari syndrome. Ann Thorac Surg 1987;44:658-9. Eswaran P, Devadoss P, Narasimhan LS, Kannan K. Synovial sarcoma of the heart: A case report and literature review. J Cancer Res Ther 2015;11:659. Bhandari V, Sakhi P, Munjal K, Varma AV, Shishodiya R, Jain VK, et al. Primary right atrial sarcoma. J Cancer Res Ther 2010;6:347-9. Tas F, Mudun A, Kirma C. Cardiac involvement in melanoma: A case report and review of the literature. J Cancer Res Ther 2010;6:359-61. Aksu T, Güler ET, Tüfekçioǧlu O, Aksu AO. Thrombi in the right atrium and inferior vena cava mimicking myxoma in a patient with recurrent pulmonary thromboembolism. Turk Kardiyol Dern Ars 2008;36:555-7.